A couple of weeks ago when I was so exhausted and on the verge of burnout, I wondered and asked what other moms do to unwind. To have that well needed time for yourself and recharge. After that I did better for some time but lately, I am tired again. On the verge of exhaustion. My own doing because I was late with my B12 shot. That is not all why I am tired, I am worried for my family for the new year and I am pregnant. Homeschooling is a challenge at those times. Being tired equals being impatient for me and it feels like this cycle is hard to beat. I am trying so hard to get back on my feet, to be that great mom again that I once, a long time ago before the car accident after Midiman was born, was. But maybe it is time to acknowledge the mom that I am today instead of chasing the mom that I was and I am trying so hard to become again. Maybe it is time to let go. And to let go of all the stress that goes with it. Looking at my boys’ happy faces I realize I am doing something right and I want to celebrate that. I want to be able to be happy but at the same time I feel sad of letting go of the person I once was and I mourn this feeling. Just taking a moment to say goodbye to the person I once was. I was wondering, how do I get back on my feet. How do homeschool moms and moms in general cope when they are on the verge of a burnout? 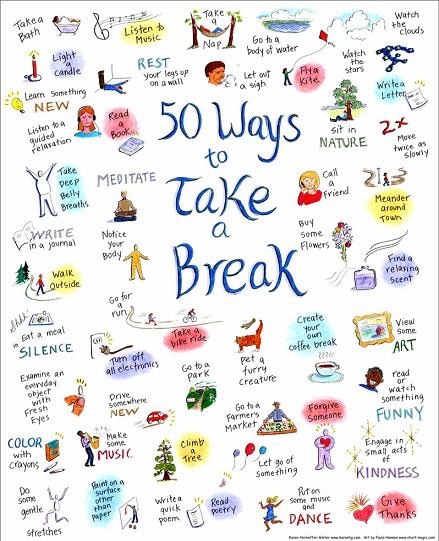 And today I read: 50 Ways to Take a Break, and the Essential First Step of Remembering . I realize self-care is very important. Taking time for me. So now I start the day by taking care of me. I set my alarm just a little before the kids wake up to give myself some time to wake up at my own pace. Than I go downstairs and make myself a cup of tea. I sit down and take time to enjoy it. My boys are getting used to my morning ritual and respect it. While I am having my cup of tea, they start waking up and start to play. These boys are awake and “on”. After my cup of tea I put some essential oils (orange and lavendar) in the diffuser, I put on some soft music and we are ready to start or day. This early morning routine helps me to be centered and I can observe without judgement. I feel the love more flowing and I can be there emphatically. By asking for my own space in these small ways, it feels also easier to receiving it. Even in the afternoons, I can ask for some time here and there when the boys are playing or when their dad finished his workday, and I can sit and breathe, or sit, crochet and breathe or meditate. I need my me-time. I also like to go for a walk, but that doesn’t necessarily have to be alone. Just breathing in the mountain air feels refreshing. And an important one of self care for me is eating healthy, drinking enough water and to get enough rest. Especially now I am pregnant. I realized I was getting so tired of consuming sugar, bread, pasta, potatoes. Another thing that I am planning to do is reading Teaching from Rest. I am curious what will work for you! Please leave your answer in the comments.